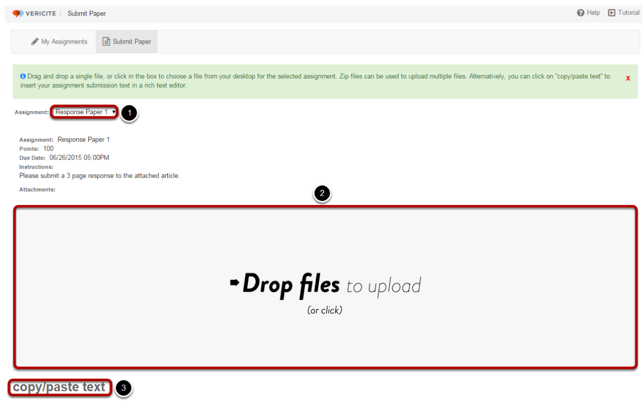 Students may submit their own assignments via file upload or copy and paste. In your Canvas course, go to Assignments. Click on the assignment you want to submit. 1. Click on the the row for a particular assignment to submit that assignment. 2. Click the Submit Paper tab at the top. Note: If the row and submission date are highlighted in red, it indicates that the assignment is due soon or is overdue and you should submit right away. After you have selected an assignment, the assignment description will display just above the file upload area. If you prefer to submit in-line text instead of a file attachment, click the or copy/paste text link to paste in the submission text. Select and drag the file or files you would like to upload from your computer into the Drop Files to upload area and release. Or, click anywhere within the Drop files area to browse for and select the file from your computer. 2. Optional Edit submission title. The default title will be the filename, but this can be modified if desired. 3. Click Submit Papers to submit all files at once. You will receive a confirmation message once the paper has been submitted. If your instructor has allowed students to view their reports, you may click on the View Report button to view the plagiarism report for this submission.